This interesting name is of medieval English origin. Recorded in the modern spellings of Hardwick, Hardwicke, Hardwich and even Hardwidge, it is a locational surname from one of the places now called "Hardwick" in the counties of Buckinghamshire, Cambridgeshire, Norfolk, Worcestershire, Yorkshire and specifically Derbyshire, where it is closely associated with the famous Elizabethan lady "Bess of Hardwick". The placenames are variously recorded in the Domesday Book of 1086, as Harduich, Hardwic, and Hardewich, but however spelt all share the same meaning and derivation. This is from the Old English pre 7th century word "heorde", meaning a herd or flock", with "wic", which like the later Viking word "thorp" described an outlying farm or settlement, which was dependent on a larger village. Eartly examples of the surname recordings taken from the surviving registers of the diocese of Greater London include: Robert Hardwick who married Margaret Grene, at St. Leonards Eastcheap on July 14th 1542, and Margerye Hardwick who was christened on October 6th 1549, at St. Michael's Cornhill. One of the early settlers in the English colonies of the New World was Francis Hardwick, recorded as being a landowner in the parish of St. Michaels, Barbados, in 1680. 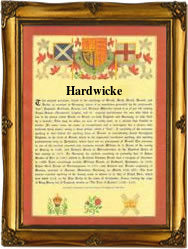 The first recorded spelling of the family name is shown to be that of Anketill de Herdewic. This was dated 1221, in the Warwickshire Assize Rolls, during the reign of King Henry 111, known as "The Frenchman", 1216 - 1272. Throughout the centuries, surnames in every country have continued to "develop" often leading to astonishing variants of the original spelling.